Commons are shared resources and social practices maintained by communities. Commons consist not only of resources such as land, knowledge, culture, fresh water, scientific research or software, but also describes the community of people managing these resources. Their collaborative, democratic, equitable governance establishes the commons as a model for organising, and as a sector in society which appears when people collectively manage and take stewardship over resources without the dominant role of either the state or the market. The digital age has opened the door to many collaborative forms of creating, remixing and sharing knowledge and culture. The success of free and open-source software, tens of thousands contributors to Wikipedia, and the flourishing open-design and manufacturing community are notable realms in which collaborative activity has transformed 20th century models of knowledge production. Hackerspaces and fab labs are massively pioneering new forms of distributed local production while tapping into a global knowledge ecosystem. Creative Commons licenses use intellectual property law to place knowledge and culture in the commons. Developments in open science and innovation are changing the way science is being performed. Open science makes scientific research, data and publications accessible to all levels of inquiry: society, amateur, or professional. A key vehicle for disseminating scientific knowledge and maintaining it as a commons is open access publishing. The platform cooperativism movement, which sees digital platforms themselves as forms of the commons, is another example. The digital-networked environment allows us to put a bigger emphasis on supporting commons-based alternatives to the market. By providing a networked public space, the Internet empowers people to engage in these collaborative practices and knowledge-sharing, thereby creating substantial economic value. And even more importantly, huge social value. Developing digital spaces that are managed as a commons with appropriate governance structures is essential to creating a digital environment that is democratic and supports values at the heart of European societies. Spaces, resources and projects managed as a commons need to be seen as equal alternatives to market mechanisms. Yet today, the digital commons are pushed to the margins of the online environment by commercial monopolies that over the years have overtaken the open sharing and peer-to-peer communication channels of the Internet. Pathologies related to the reliance of all mainstream projects on advertising revenue - disinformation, hate speech, weakening of social bonds and destruction of individual attention - are proof that an exclusively market-driven logic fails to support a democratic and fair digital environment. For each success of the digital commons - such as Wikipedia, which remains one of the most popular non-commercial, online platforms in Europe; or the adoption of free software as a standard for much of the online infrastructure - we observe even more places where market logic limits the potential of the commons. The potential of digital technologies to offer open access to crucial knowledge and cultural resources is not being fulfilled. Similarly, spaces in which digital technologies are employed to share resources are quickly captured by dominant market platforms thant seek a commercial rent on the basis of the contributions of users. The term "sharing economy" has lost its original meaning, and today instead denotes a class of monopolists that extract profits from the use of housing, vehicles and other goods and services. Most of these profits are not re-invested in the well-being or regeneration of local communities. The commons approach overlaps with or feeds into an emerging political discourse where wellbeing and social wealth are not defined in terms of narrow economic criteria like GDP or corporate profit. Instead it looks to a richer, more qualitative set of criteria that cannot be easily measured: moral legitimacy, participation, equity, resilience, social cohesion and social justice. It promotes a regenerative economy based on circular principles and its primary aims are to maintain a sustainable system for people and the planet. Local community and participatory culture are core building blocks of such a system. Europe has the opportunity to strengthen, promote and facilitate commoning activities and commons-based production. We can increase ecological resilience in a truly circular economy - an economy that is restorative and regenerative by design. European policymakers need to adopt a hybrid approach, in which market-based and commons-based solutions are considered side-by-side as governance models for core aspects, spaces and layers of the Internet stack. 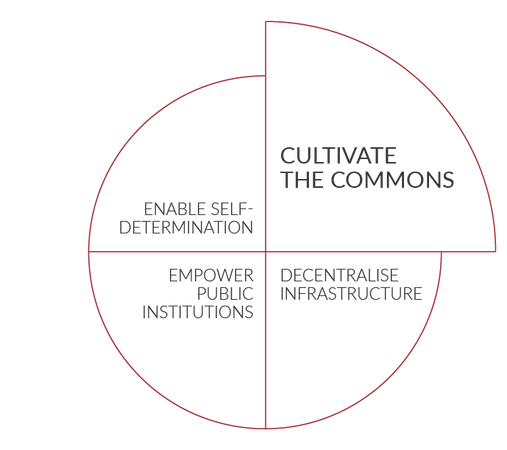 We need to identify situations in which a "commons-first" approach should be adopted. European policies that support open science and open access to scholarship and data in the European Research Area are a great example of such an approach. Supporting a decentralised, community-based sharing economy that supports local commons is something that can be legislated at the EU level and which will have a real impact on the ground.